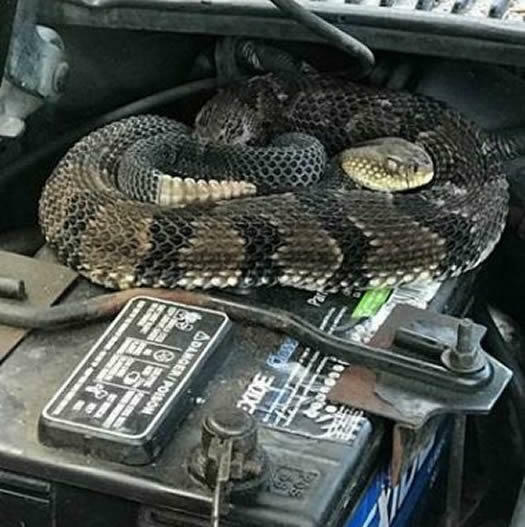 On June 11, Lt. Nate Ver Hague and ECO Mark Vencak responded to a complaint of a rattlesnake resting on an engine block in the town of Hancock. The complainant told them that he had opened the hood of his car to jump start the vehicle and heard the distinctive rattle of a snake. He backed away and saw a large rattlesnake resting in the center of the engine block. Disturbed, the snake slithered over to the battery and curled up there. The officers confirmed the snake was a timber rattlesnake seeking shelter. ECO Vencak carefully extracted the snake from the engine compartment as Lt. Ver Hague untangled the tail wrapped around part of the engine. The officers released the snake nearby, next to several large boulders - a much more snake-appropriate habitat. Timber rattlesnakes are New York State's largest venomous snake -- here's the DEC fact sheet on them. ("Timber rattlers impress one as being very stocky..." Hey, no judgements.) And here's a somewhat old DEC map of their distribution around the state. Their populations are mainly clustered in the southeast part of the state from the southern Catskills to the state border, though there are also some populations near Lake George and Lake Champlain. All freaking out aside, snakes are an important part of ecosystems, often acting as predators on rodent populations. And New York State is home to 17 species of them, according to an info page from SUNY ESF. Three of those species are venomous -- "All three are uncommon." From the "Jobs We Didn't Know Existed" file: Aerial fish stocking. The short clip embedded above is state Department of Environmental Conservation video about its work stocking lakes and streams in remote parts of the Adirondacks -- sometimes by helicopter or plane. Each year DEC releases approximately 900,000 pounds of fish into more than 1,200 public streams, rivers, lakes and ponds across the state. These fish are stocked for two main purposes-- to enhance recreational fishing and to restore native species to waters they formerly occupied. Raising these fish is a big task that requires precise methods and specialized equipment and facilities. The DEC runs 12 fish hatcheries, each specializing in raising one or more species of fish, including brook trout, brown trout, rainbow trout, lake trout, steelhead, chinook salmon, coho salmon, landlocked salmon, walleye, muskellunge and tiger muskellunge. Here's the 2018 list of the bodies of water in which the DEC releases fish. 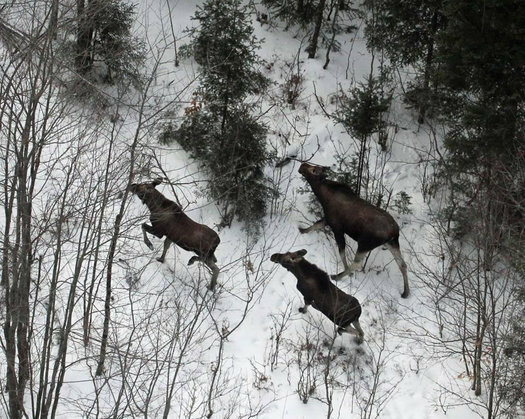 The state Department of Environmental Conservation is doing another aerial survey of the moose population in the Adirondack Park. And, of course, there are photos -- that's one of them above (more at the link). See also: DEC's Flickr gallery of moose photos. DEC says that early results point to the moose population being about 400 in the park. Here's an info page on moose in New York, along with details about how to report a moose sighting. By the way: moose are very big and strong and should be given plenty of distance. + If you see a turtle on the road, please try to avoid hitting it with your car. Do not swerve suddenly or leave your lane of travel, but take care to avoid hitting turtles while driving to "give turtles a brake". + Be on the lookout for turtles and slow down, especially on roads near rivers and marshy areas. + If you see a turtle in the road or shoulder and you can safely stop your vehicle and approach the turtle, please consider moving it to the shoulder on the side of the road in the direction it is facing. + Picking the turtle up by its tail may frighten or injure it. Most turtles, other than snapping turtles, can be picked up by the sides of its shell. + slide a car mat under the turtle to drag her safely across the road. 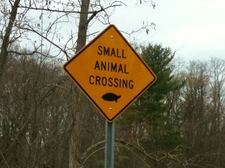 See a video of how to help a snapping turtle cross the road (leaves DEC website). + Do not take the turtle home. All turtles native to New York are protected by law and cannot be collected without a permit. There are 11 native species of land turtles in New York, according to DEC, which says the populations of each are in decline. Noted: The state Department of Environmental Conservation has an Instagram account. It includes many good photos of birds (owls) and other animals (moose) from around the state. Autumn is a prime hiking season -- the warm sun and cool air makes for comfortable weather, and of course, there's the foliage. This autumn hikers should properly prepare for hikes in the Adirondacks and hike on trails less populated than those in the High Peaks Wilderness, an opportunity that offers fantastic scenes of fall foliage for a more enjoyable backcountry experience, New York State Department of Environmental Conservation Commissioner Basil Seggos urged today. "Autumn is a great time to enjoy the Adirondacks," Commissioner Seggos said. "As more people continue to enjoy the incredible outdoor excursions offered throughout the Adirondack Park, we encourage visitors to explore the hundreds of lesser known trails that offer the same high quality natural experiences as the more popular trails, and to be prepared to safely enjoy the Park's changing conditions." Toward that goal, DEC is offering a dozen different hikes in the Adirondacks as alternatives. We've taken the DEC's suggestions and put together a clickable map with with brief descriptions of each -- have a look. 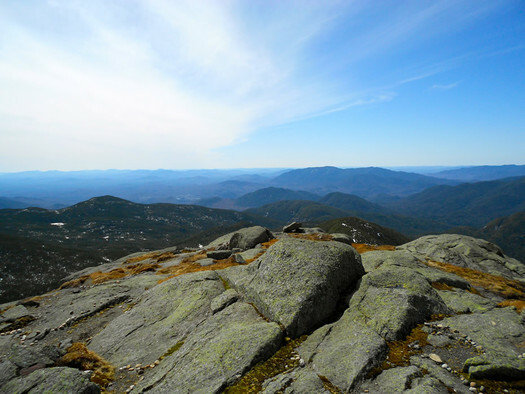 Earlier on AOA: How to get started hiking the High Peaks: Part I and Part II. Many of Cristin's suggestions hold for non-High Peaks, too. Using band data, DEC biologists can track the birds age, movement and dispersal activity. The silver band is a federal ID band that is tracked by the U.S. Geological Survey (USGS) while the blue band is a New York State ID band. From a distance you can sometimes see the colored band and at least know that that bird was born in New York. With a good spotting scope it's also possible to read the letter and two digit number code when the bird is perched. That data can be reported to DEC biologists and we can track their movement. That link above includes more photos of the chicks and their nest. Bald eagle populations had been almost entirely wiped out in New York State by the 1960s, in part because of an insecticide called DDT that weakened the shells of birds of prey. 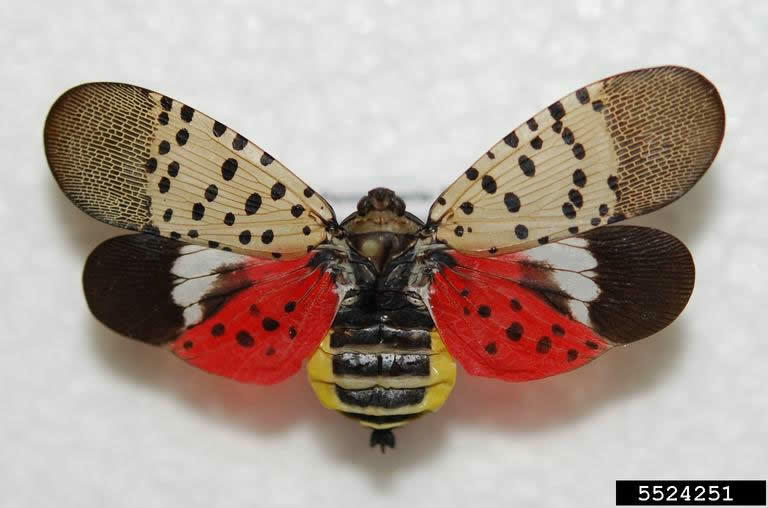 (Museum specimen collections such as the one at the New York State Museum helped biologist figure that out.) The pesticide was banned in the early 1970s. 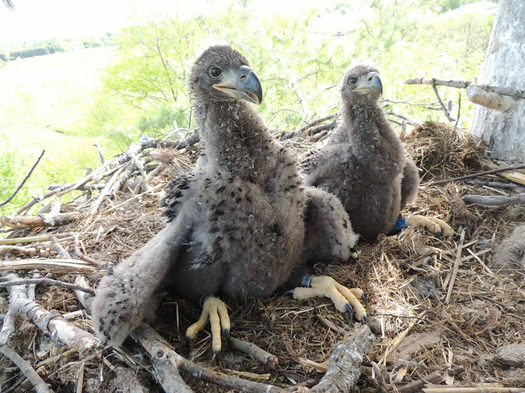 And in 1976 a program aimed at re-establishing bald eagles in New York State started relocating young eagles from other parts of the county, and it helped rebuild the population in the state -- and it's still growing. Earlier on AOA: What, your job doesn't involve baby bears? There are 181 native and introduced freshwater fish species in New York State. 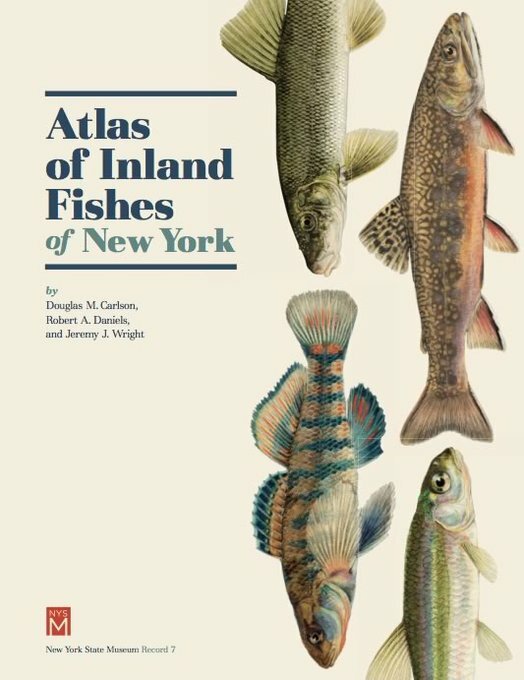 That's one of the many, many bits in a huge new catalog of the state's fish released this week as part of joint effort by the New York State Museum and the state Department of Environmental Conservation. It's the first such publication in three decades. The book is available to download for free as a pdf from the State Museum website. It's fascinating to flip through the atlas, gawking at some of the wildly-colored or shaped fish, and seeing how they compare or contrast with other similar fish. It's also interesting to see the geographic ranges of each species plotted -- how some species live only in a few river corridors, others are confined to specific watersheds, and others are pretty much everywhere. * "Scientifically fascinating ichthyofaunas" really should be some sort of state marketing slogan. If you'd like to speed through the clip, you can switch it on 2x speed by click the gear icon. Farther afield: Check out this video of a helicopter dropping water on the large wild fire in the Sam's Point Preserve in Ulster County earlier this week -- it was posted by the NYS Department of Environmental Conservation. The agency has also posted photos from the burned-out area. They're eerie. By the way: That bucket suspended from the helicopters is called a "Bambi Bucket", and it was dropping 250 gallons, according to DEC's description. 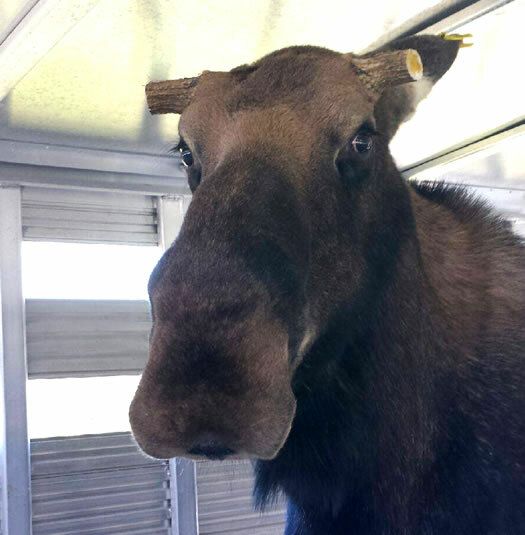 Nine additional cow moose were recently captured, collared and released as part of a multi-year moose study. There are now a total of 21 moose, including 18 cows, fitted with GPS/radio collars. Their locations are monitored weekly. Here's a DEC map of public moose sightings in 2015. You can see they're largely concentrated in the Adirondacks. 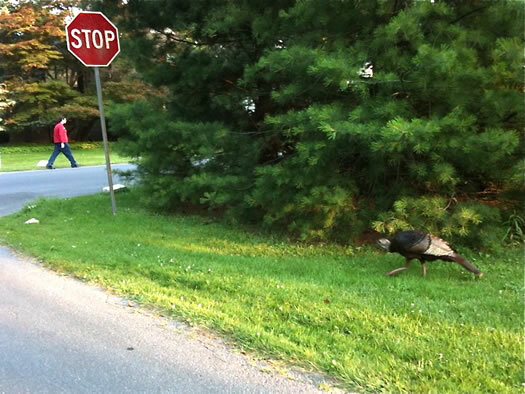 But the animals do show up in the Capital Region from time to time, especially in Rensselaer and Saratoga counties. There was that moose in Halfmoon a few years back, and the moose spotted at the Saratoga Race Course a few years before that. DEC has reported in the past that scientists have collected evidence indicating moose populations in New York State have grown considerably during the last few decades -- from as few as 50 to 500 or more in recent years. 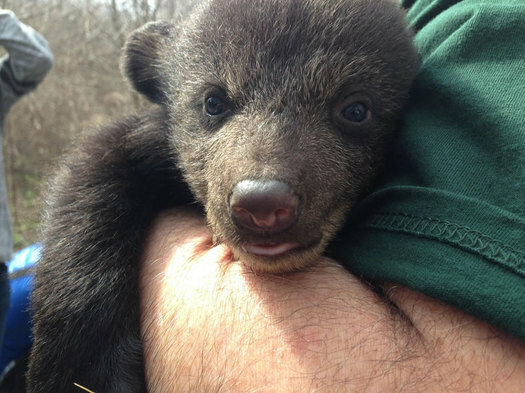 [Tuesday] morning, Environmental Conservation Officer Anthony Glorioso was called to Windham Mountain Village (WMV) in the town of Windham where a bear cub was stuck in a tree high above ground. With the assistance of a local construction company's boom crane, Officer Glorioso went 65 feet up to get a better look at the situation. The officer attempted to free the cub but quickly saw his neck was stuck. Once the "v" was cut out of the tree using a chain saw, Officer Glorioso grabbed the cub and brought it into the bucket. As soon as the bucket came down, the cub ran back into the wooded area. The Watershed Post talked with the townhouse development's property manager about the situation -- the bear had been stuck in the tree since Monday and had been calling for its mother. A still from a video clip shortly after the bear fell from the tree. 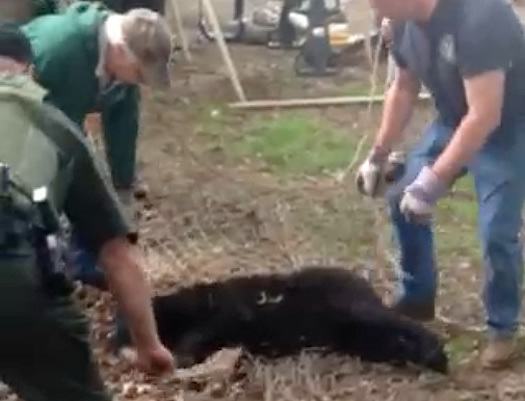 The black bear that had been caught in a tree in Albany since Tuesday fell to the ground Wednesday just before 1 pm after being hit with tranquilizer darts. The state Department of Environmental Conservation reported later Wednesday afternoon that the bear had been euthanized. The state Department of Environmental Conservation strives to relocate wildlife in situations where they enter urban and suburban settings. In this case, wildlife biologists determined this course of action is more humane and necessary to preserve public safety because of the bear's injuries and its history of returning to urban and suburban settings. The video still above is from the scene just after the bear hit the ground. A witness sent the video to AOA -- the full clip is posted after the jump (thank you, Dawn). While not graphic, the video is a bit hard to watch knowing the context. Um, where are my antlers? Kind of like waking up to find out that someone cut your hair. * Yes, we know that's not the plural. But it should be. 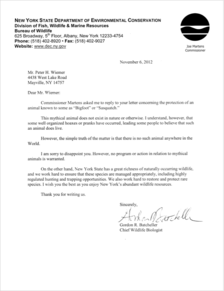 Commissioner Martens asked me to reply to your letter concerning the protection of an animal known to some as "Bigfoot" or "Sasquatch." This mythical animal does not exist in nature or otherwise. I understand, however, that some well organized hoaxes or pranks have occurred, leading some people to believe that such an animal does live. However, the simple truth of the matter is that there is no such animal anywhere in the World. I am sorry to disappoint you. However, no program or action in relation to mythical animals is warranted. 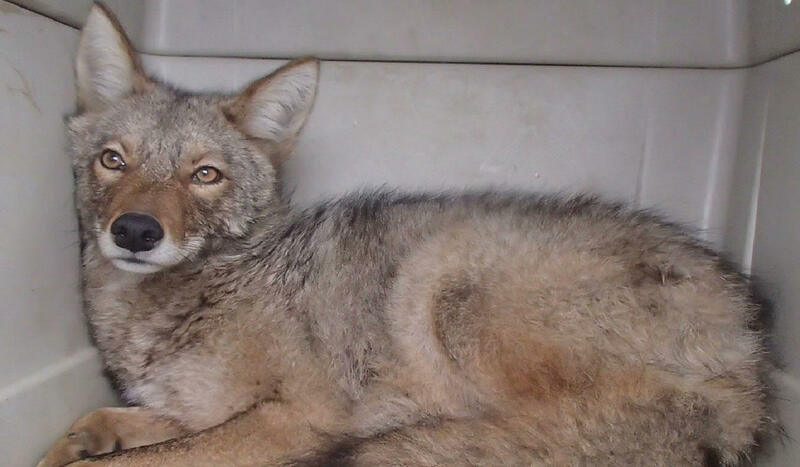 On the other hand, New York State has a great richness of naturally occurring wildlife, and we work hard to ensure that these species are managed appropriately, including highly regulated hunting and trapping opportunities. We also work hard to restore and protect rare species. 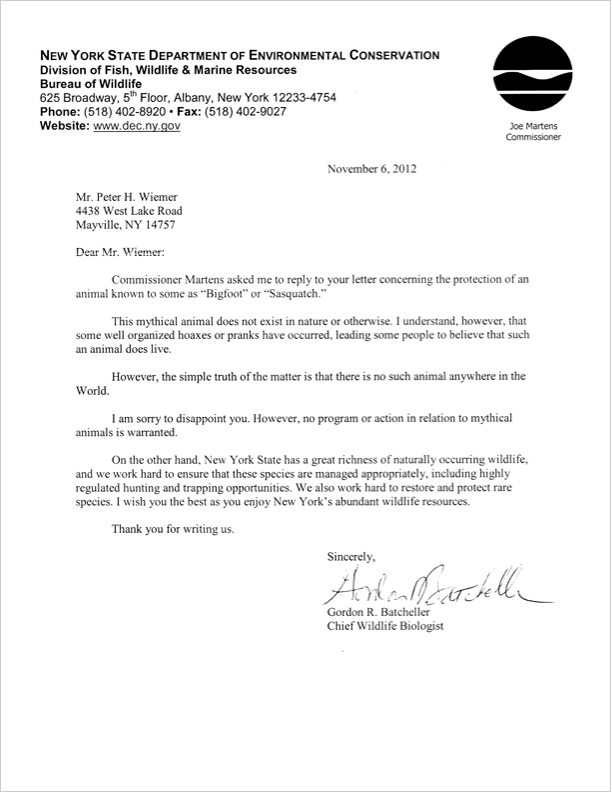 I wish you the best as you enjoy New York's abundant wildlife resources. We contacted DEC about the letter and agency spokesman Rick Georgeson confirmed it's real. Also: "We have no further comment on this issue." Earlier correspondence between Mr. Wiemer and DEC indicated that if sasquatch were real, they would be protected by state law. Good to know. From Mr. Weimer's press release this week: "We have had nine eyewitnesses to date, of Bigfoot sightings in Chautauqua County come forward resolving themselves of the burden of knowing what they saw and were afraid of or not willing to tell because of fear of ridicule. All but one wished to remain anonymous." Update: The TU's Casey Seiler talked with Wiemer about his concerns. By the way: The second Chautauqua Lake Bigfoot Weekend & Expo is scheduled for for April 26, 27, and 28. Well played, Mr. Wiemer.